On April 18th, I ordered a chair for Jennifer (our new Business Development Manager at Brian Joseph Studios) from OfficeMax.com for our offices. OfficeMax said it was shipped the evening of the 18th. On the 21st I called them and asked them for tracking information, to which they replied that they do not provide tracking for purchases. Unable to provide tracking in 2011? Seems quite odd. Even the most basic, or small online stores provide tracking information. At the end of this phone call, the rep said that I would receive the chair “today at the latest”. Strange. It was already the afternoon, and I was to receive my purchase “today at the latest”. Makes me wonder what the “earliest” might have been. April 21st came and went, and of course, no chair. So, on the 22nd, I called again, and spoke with another rep. Same thing. “It will definitely be there today. 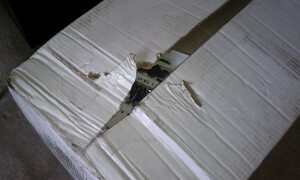 I can’t give you tracking information because we shipped the chair through a private shipping company”. Errmmmm….ok. “Private shipping company” you say? Yet again….this seems odd. Obviously, they are quite “private” as they won’t come out of hiding with my chair! The rep then told me to call Monday morning if the chair is still not here. The 22nd came and went, still no chair. Then the weekend passed by, still no chair. On Monday, April 25th, I called OfficeMax for the third time. Finally, this rep seemed to actually have some idea of what customer service was supposed to do….She said sorry that the chair hasn’t arrived, and it should have by now. She said she would submit a ticket/alert to find out where the chair was and why it hasn’t been delivered on time. I also asked her if she would send me a gift certificate or something to try and smooth this over, and she said that she would. I’m not too sure if she will, but she sounded sincere. The amount that will be on the gift card, if it comes, remains to be seen. Tuesday, April 26th arrived, and we missed a call from a delivery guy, saying he was unable get to the office. Then, the worst part of this entire experience…this morning (Wednesday), the delivery guy calls us at 6.45am to say he is delivering the chair. 6.45AM!? Unreal. 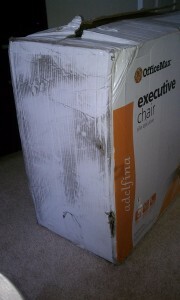 So, thankfully, we now have the chair, about a week after it was supposed to get here. Oh, you were wondering what the package looked like when it got here? Unsurprisingly, its condition was perfectly in line with my overall experience with OfficeMax to date.